Performance Energy for Men delivers essential nutrition customized to meet men’s daily health needs. Antioxidants, including 5,000 IU of vitamin A, 250 milligrams of vitamin C, 30 IU of vitamin E, and 200 micrograms of selenium, promote skin, eye, immune, prostate, and reproductive health. A potent vitamin B-complex promotes energy production and stamina for active men. In addition 1,000 IU of vitamin D3 promotes healthy blood flow, brain, and cardiovascular health, as well as calcium absorption for strong bones and teeth. This blend contains no iron. 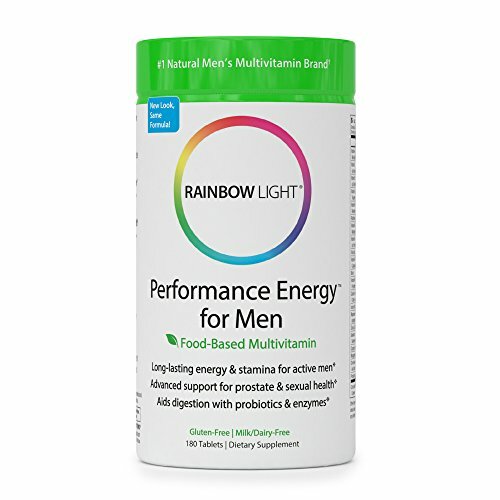 In additional to vital nutrients, Performance Energy for Men contains a targeted blend of foods and herbs for prostate and sexual health support. The 1,805 milligrams of Performance and Stamina Blend–includes L-Arginine, Asian and American ginseng, organic spirulina, ginger, ginkgo, muira puama, eleuthero, and saw palmetto extracts- traditionally used to support increased vitality, endurance and healthy energy.